Coarse Grain Alaea Hawaiian Sea Salt - 2 lb Bag | San Francisco Salt Co.
Alaea Hawaiian Red Sea Salt is a traditional, native salt blend of the Hawaiian islands. Our salt is harvested from the Pacific Ocean using ancient, traditional methods of solar evaporation to collect the sea salt and its natural trace minerals. 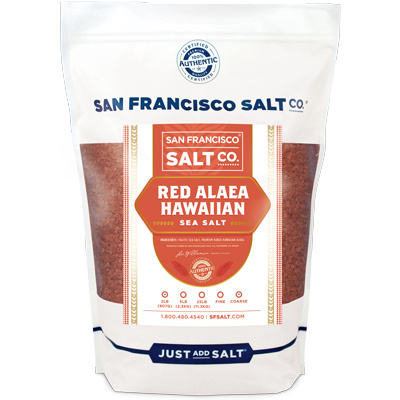 The salt is then infused with Alaea Hawaiian Volcanic Clay, which is rich in 80 reported naturally occurring trace minerals, including iron, which gives it it’s extraordinary natural red hue. 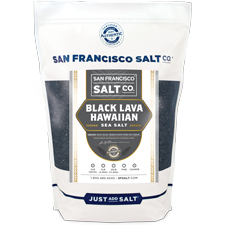 SACRED CEREMONIAL SALT - �Native Hawaiians considered Red Alaea Clay to be a sacred, powerful healing tool that was used as an ancient treatment for broken bones, bug bites, burns, and various other ailments. 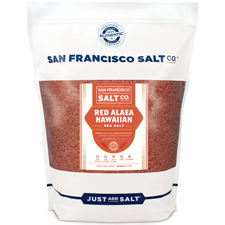 Alaea Hawaiian Red Sea Salt was used to cleanse, purify, and bless tools, canoes, homes and temples. Native Hawaiians believed that the Red Alaea Clay gave the salt it's spiritual power; to this day it is still used in traditional ceremonies, ritual blessings, and for purifying and healing purposes. CREATE YOUR OWN YOUR BATH SOAKS & SCRUBS - Combine equal parts of Red Alaea Hawaiian Salt and face/body wash to create a naturally detoxifying sea salt scrub that works to rid the body of dry, rough skin, encourages turnover of new skin cells, draws impurities out, and smooths and brightens the skin. 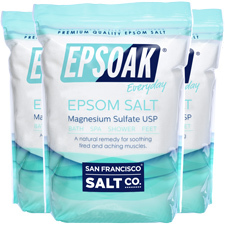 This salt is the perfect all-natural, colorful alternative to traditional bath salts. Red Alaea Salt also makes a great addition to custom bath salt blends when combined with essential oil fragrances. PLEASE NOTE:�Due to its natural harvesting process, this salt may arrive slightly damp because of moisture in the salts. For best results and an easier clean-up, only use in a clean bathtub (without existing soap residue) to prevent Red Aaea Clay from sticking to�tub. PACKAGING�- 2 lb. Resealable Bag. INGREDIENTS�- Sea Salt & Premium Baked Hawaiian Alaea.